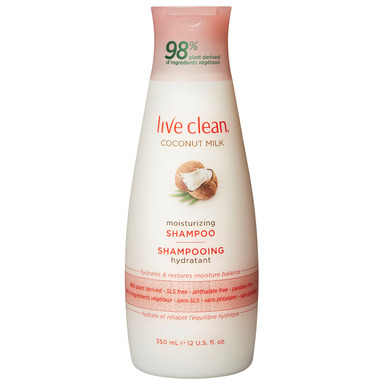 Coconut Milk adds hydration and balance, while nourishing and restoring hair health in Live Clean Coconut Milk Moisturizing Shampoo. It's luxuriously creamy to make hair soft, shiny and supple Coconut Milk properties provide extreme penetrative qualities rich in vitamins C, E and B’s. Seems great so far (first time user) time while tell more. Second bottle, need I say more? The shampoo works very well in my hair, moisturizes but does not leave my hair feeling heavy or greasy. It has a nice smell, just a little stronger than I'd like. Like the smell. Leaves my hair very clean! Love this shampoo - makes my dry hair feel soft and silky. Definitely will repurchase. lovely scent, great lather. This is now my everyday shampoo. I like this shampoo. It leaves my hair light. Good for my curly hair. Great shampoo with no chemicals. I love this shampoo! A little goes a long way and works really well in my coarse, dry, curly hair. This shampoo is amazing, I am definitely hooked. Love the smell. I am a huge coconut fan! Smell is nice. I have very thick and long wavy hair and works just as well as some of the expensive salon brands I have tried. Love that this brand is free of all the chemicals that was in my old shampoos.